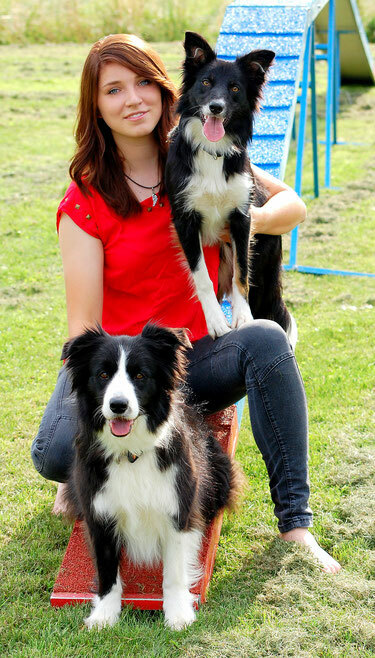 About me - Border Collie Kennel "Keen Workers"
We, that is my mother Claudia, my father Joachim and I, live together with our special dogs in Aalen, specifically in Essingen. The quiet village lies about 70 km east of Stuttgart. We live here in a beautiful family home right next to the nursery of my father. My father and Funny dicovered together the dog sport "Obedience" for itself and Funny was definitely busy with both sports. So in 2004 our first "real" sport dog - an Australian Shepherd lady named Silver, moved into our house. Silver is an extremely talented Aussie regarding Turnierhundesport, Obedience, and especially with regard to all sorts of tricks. In our club we had a Show Group, with which we had gigs at some events, like anniversary celebrations or private parties. In Turnierhundesport we could also win several high-level championships. Due to her amazing character, we decided to breed with Silver. More on our Aussie breed on http://www.mighty-dezire.de/index.htm (webpage and not up to date;) ). Already at these times I had the desire to have my own dog and for me it was clear from the beginning: It can only be a Border Collie! This breed had simply fascinated me in every way and this fascination has not changed until today. After much persuasion (I was only 13 years old) in 2007 my first Border Collie moved in our house. With Crazy a long-awaited wish of mine come true and it exceeded all expectations. Crazy was my first dog in agility with which I initially also made some mistakes accordingly. Crazy is a very reliable dog in agility and if you had to depend on her, you could always rely on her, according to the motto: "Crazy knows when it matters." She was a very good teacher for me, and because of fact that she did not have this crazy Border Collie speed I could thereby arrive well into Agility. 2010 our fourth dog moved in. Bailey is a daughter of Silver from her second litter. She has become a Mommy-dog and is her constantly following shadow. My father started doing Obedience and Agility with Bailey. Obedience unfortunately was only possible in training, because Bailey could not stop barking. My father had to give up Agility as well because of health reasons, although the two have made it to level A3. After several years of Agility experience I had the desire for a Border Collie, which brought exactly this madness and thus also the corresponding speed, but also the necessary thinking skills with it. I searched almost 2 years until I came across the perfect Dutch lines. I was fascinated by the working abilities and also the beauty of the dogs from these lines. Eventually I ended up at Tequilas breeder Pia Gutjens and her husband Math. I'm so happy to that I met such incredibly kind and generous people who have entrusted my dream dog Tequila. Thanks Pia and Math, I do not know how I can thank you! Up to now, I am an active agility sportsman and love and live this sport. I spend almost every weekend at competitions and love to run with my two girls.